Gem crystal clear through all-in-a-veil rock crystals are naturally grown together in a definite smile. 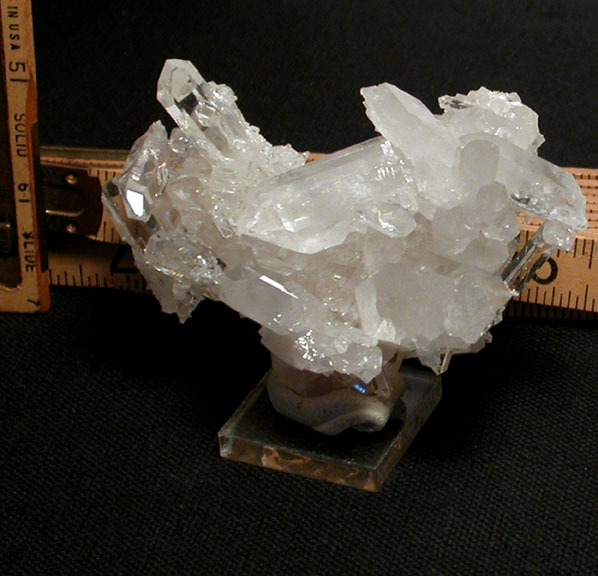 From the long-closed Clear Creek Mine [the Hogjaw area of Montgomery County, Arkansas] which was known for brilliant points and clusters, it's 1-1/2x 2-1/2x 3-1/2" wide. Its' slightly indented plate bottom also has cryptocrystalline [too young to have become discrete crystals] quartz in lacy ribs. Points include channels, split-faced [you'll use both sides of your mind], a large uncommon 7h faced crystal, and range up to 3/4x 2-3/4". Twins, doubly-terminated crystals, a few crystals in regrowth, penetrators - and plenty of rainbows for you!